Here is another dish that I crave during the hottest months of the year. These wraps are great for long, lazy summer conversations. Just place all the components in the middle of the table and let your friends participate, assembling their own portions. 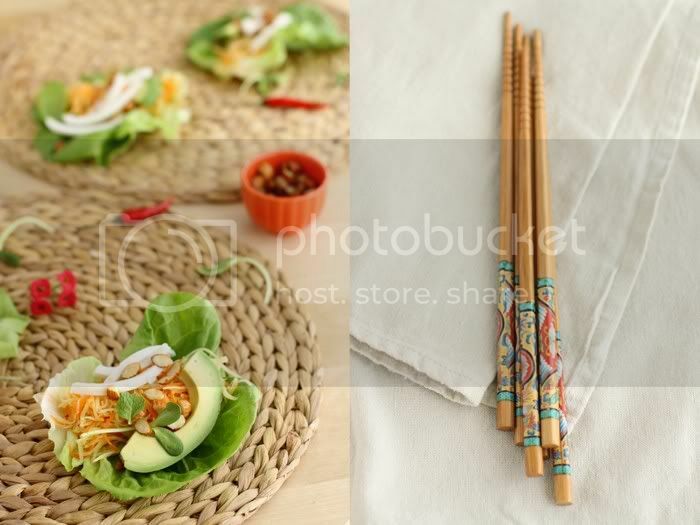 These wraps were very much inspired by Vietnamese cuisine, where the flavours are bright and fresh with plenty of herbs and, often, a great crunchy texture. The julienned green papaya salad adds the said crispness, and a spicy kick comes from the added chili pepper and ginger. 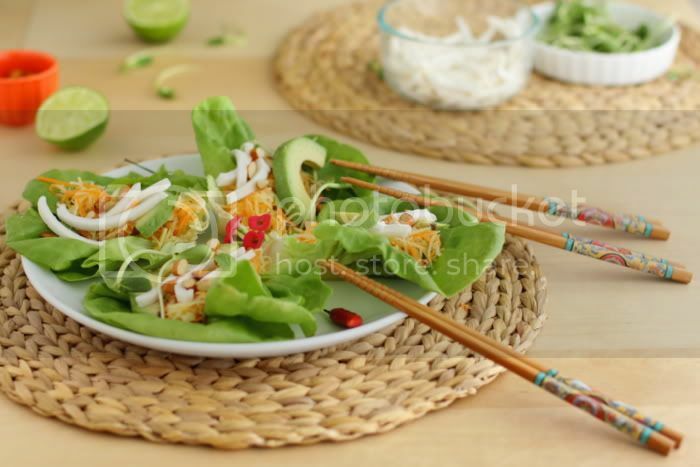 The bold flavours of the salad are then balanced with rich and creamy avocado and coconut meat. Top it off with salty almonds and sprouts, and you’ll have a light and very refreshing summer lunch or dinner. 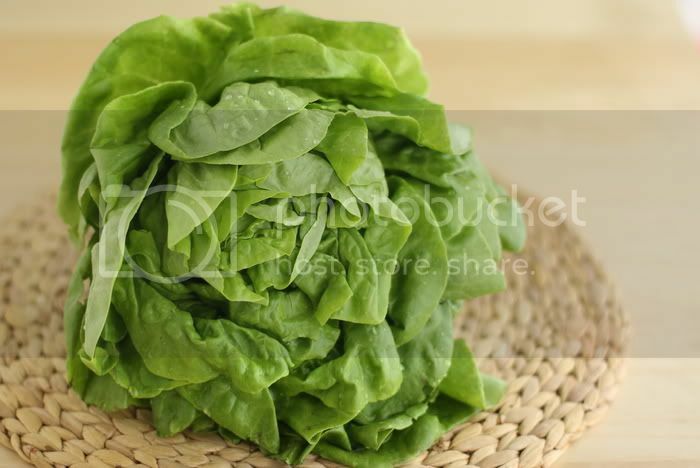 As wraps, we like to use Boston lettuce leaves, they are very pretty and soft, and work wonderfully with the rest of the ingredients. But any other leaf or even rice paper would do just fine. The great thing about this dish is that many of the components can be prepared ahead of time, and the assembly is a breeze. We are in New York at the moment, amazed by the splendor of local produce. We’ll tell you all about it next week. Hope you enjoy your weekend. In a small bowl, whisk together the nama shoyu, mirin, lime juice, sesame oil, agave, and minced chili. Pour the mixture over the julienned vegetables, sprinkle with salt and toss to combine. Let sit for at least 30 minutes. Drain before serving. Mix the almonds with oil and salt to taste, set aside. Separate the leaves, wash and dry gently with paper towels. 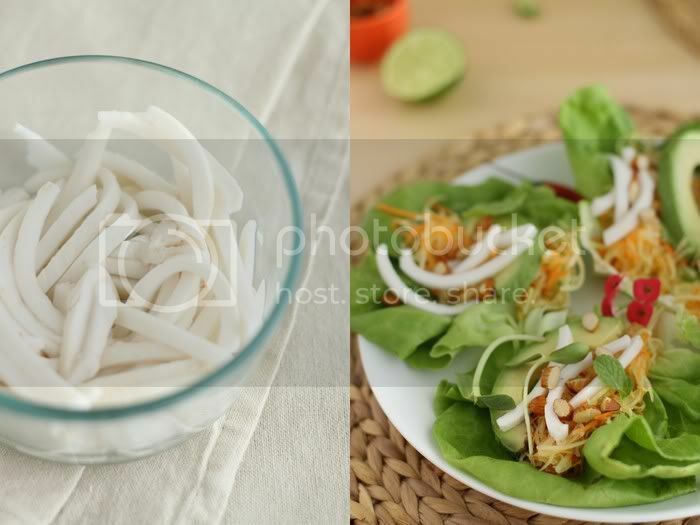 Place a small amount of the julienned salad in the middle of each leave, add avocado slices, coconut meat, herbs and sprouts, and sprinkle with salty almonds. Carefully fold in the sides and enjoy. These little healthy beautiful wraps look so delicious. They would be perfect for every day lunch at my house with my kids! 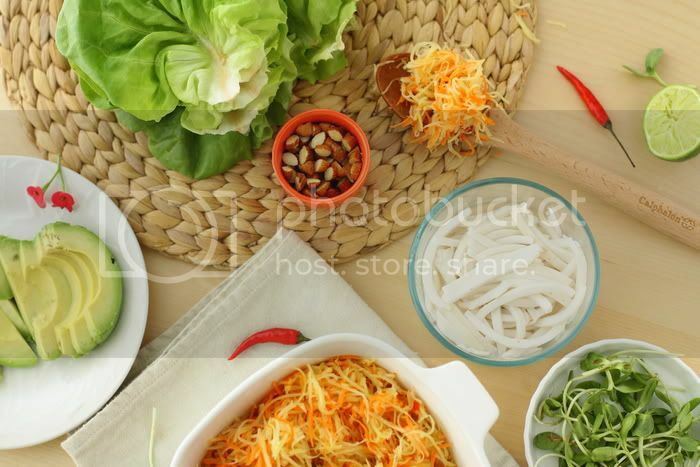 Thanks for posting–i love Vietnamese cuisine. . .
yum! what a great flavour and texture contrast. I could eat one right now for sure. Oh my, I too crave this kind of fresh goodness during the summer! Glad to have found your blog on FG. You guys continue to impress. Can’t wait to make this! So that’s what fresh coconut meat looks like! Makes me want to try it even more :) Thanks for this wonderful post. These look so tempting, must try. From Viet Nam to NYC, you are a globe trekker! Great dish, love the idea of using green leaf instead of rice paper. I’m sooo impressed that you managed a couple posts while travelling!! Creating, shooting, styling and writing away from your own kitchen and studio is certainly trickier! Nicely done! Must try this combo, sounds deelish! Love green papaya!